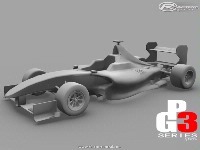 Gp3 series is a new recruitment formula for the massively competetive GP2 series, and Formula 1. A full flegded racer with double wishbone dual shock suspension, adjustable anti-roll bars, and racing slicks from Pirell mounted on O.Z racing alloys. Renault F1 has developed the engine, producing a massive 280 HP at 6500 rpms turbo boosted 2 litre. A crude, raw sounding engine gives the driver a true sense of agressive power when driving, and the crowds an enjoyable roar as they pass. Developement will be a learning curve for me as I am alone in developing the mod. Engine: 90% done. Initial testing with existing mods. Modelling: Car is 80% extiriorally done. Need to do cockpit wheels and lights. Gearbox: Hewland 6 speed done (FTR 6). Is the beta version ready even if its just the shape of the car? it's possible to be a beta tester for this mod ? sort out any data you might need. any news? really looking forward to this mod. Thanks for working on it. I can help with skins if you want.